A sovereign nation of many nations that have broken free from the British monarchy and its tyrannical system of “crown law”. Kanata is convened under a public Proclamation of January 15, 2015 that establishes it as a constitutional republic under the common law. The Republic has over 1,000 founding signatories but reflects the wishes of nearly 60% of Canadians, who when polled in 2013 favored an end to all ties with the British monarchy. 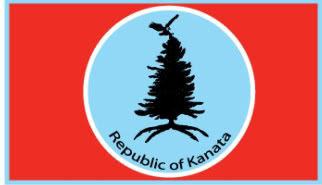 The Republic of Kanata is also the fulfillment of the aspirations of the first patriots who attempted unsuccessfully to create such a Canadian Republic in 1837. “Kanata” is an Iroquois word meaning “our communal village”. Is the Republic of Kanata an actual lawful government? Yes. Its founding Constitution disestablished the political authority of the British crown in Canada and replaced it with a sovereign nation consisting of free, self governing people. The legal legitimacy and jurisdiction of the Republic was created by an Act of Supremacy in its first General Congress, which established a High Court of Justice to administer the common law everywhere in the new nation. The authority of all former agents and officials of the crown was formally revoked by this Act. 3. How does the new Republic affect my life? Freedom from Debt Slavery: You are now freed from all of your former debts, mortgages and taxes, which were declared legally null and void by the Constitution of the Republic. Any attempt by agents of the old regime of “Canada” to collect such debts or coerce you are now illegal acts, and the perpetrators can be arrested by Republican sheriffs and tried for treason by the common law courts of the new Republic. All banks, credit and money supply are now under the control of the people. No income tax: Abolished under the new Constitution. Prosperity: You are eligible to receive up to two hundred hectares of land formerly held by the so called “crown”, as well as a guaranteed annual income from the wealth formerly hoarded by the crown agencies and their super-rich corporate partners. Justice: You now have direct control over the law and the courts of the land by electing their judges, juries and sheriffs. Direct Democracy: If you are sixteen years or older, you can now vote in elections every two years to the General Congress and every year to local governing bodies. You can also now recall any elected or non elected public official, judge or sheriff who has violated their oath of office or lost the confidence of the people. The basis of all legitimate government and authority. It is inherent in all men and women and establishes them as unconditionally free, self governing and sovereign people whose life and liberty cannot be subverted by any power. Are common law courts legal and valid? Yes. Their authority and legitimacy as upholders of the rights of the people is recognized by the United States Supreme Court as well as Canadian “crown” courts, which are descended from the English common law tradition. That tradition recognizes that the people themselves are the best guarantors of their own freedom; and that therefore, the law is upheld and defined by citizen juries and enforced by local county sheriffs beholden to the people and not a central government. Who is Kevin Annett and what is his role in the Republic? Kevin is a leader of the common law and Republic movement, and of the International Tribunal into Crimes of Church and State (ITCCS). He serves as a special adviser in common law to the Republican government and works actively with many victims of crimes against humanity, in Kanata and around the world. He is also the Convener of District One (West Coast) in the Republic. Kevin is also a Nobel Peace Prize Nominee and award winning author and human rights figure. Born and bred on the prairies and west coast, Kevin is the former United Church minister who first exposed and documented genocide by church and crown in the Indian schools. (www.hiddennolonger.com) . A biography of Kevin and more information is found at www.itccs.org and www.KevinAnnett.com . How do I go about joining the Republic and getting involved? The Republic of Kanata is a fact: as of January 15, 2015, you live within its common law jurisdiction anywhere on the territory of the former “Dominion of Canada”. However, you can declare your formal citizenship within the Republic by taking a Pledge to the Republican constitution and receiving official identification as a member of the Republic, including a passport and citizenship papers. You can also take an oath of office as a sheriff or other public official, and become involved in your local branch and District, by contacting republicofkanata@gmail.com . Do indigenous nations have to be a part of the new Republic? No. If any genuine indigenous nation decides unanimously not to be affiliated with the Republic, they may legally secede and establish their own separate nation within the general Federation of the Republic. However, the indigenous nation may not create laws or practices that violate the Constitution and common law of the Republic. If the indigenous nation remains within the Republic, they will have guaranteed representation in a separate Chamber of Indigenous Nations within the General Congress. Am I at risk under the new Republic? There are risks involved in any freedom movement. But the law and the people are with us, and more police are coming over to our jurisdiction every day alongside our growing network of sworn common law sheriffs. Your liberty and security will be guaranteed the more you make the Republic a reality by your own refusal to participate in the old system called “crown law” and “Canada”. Turn away from the old and reclaim the land, the law and the future, for all of us.